Let’s face it: light bulbs can be confusing. Knowing which bulb you need is hard enough, let alone trying to understand all this jargon being thrown around by the lighting industry. Below is a list of 10 commonly used lighting terms that will have you talking like a pro in no time. Lumens (initial): While the amount of light a bulb produces is measured in lumens, the amount of light a bulb emits at the beginning of its life is referred to as initial lumens. Of course, the higher the initial lumens of a bulb, the brighter that bulb is going to be. Lumens (mean): The term mean lumens is the amount of lumens the bulb produces at 50 percent of its life. Volts: Think of volts, sometimes referred to as voltage, as a measure of electrical potential. Voltage is what pushes electrical current through a conductor. Typically, residences are wired for 110-130 volts, with businesses being wired anywhere from 220-277 volts. 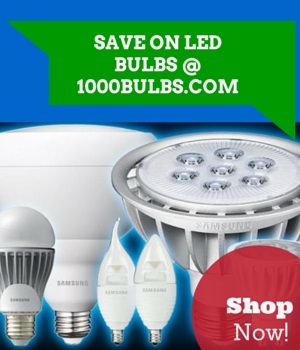 Most of your household bulbs operate at 120 volts. Watts: This is probably one of the terms you hear the most. Watts (also referred to as wattage) refers to power consumption and the rate at which energy is drawn from an electrical system. The higher the wattage of the lamp, the more electricity that lamp will consume, and the higher your electricity bill. Efficacy: Efficacy is the measure of lumen output per unit of power, and is measured in lumens per watt, expressed as “13 lumens per watt”. The higher the lumens per watt, the brighter the bulb, equaling a higher efficacy. Color Temperature: Despite its name, color temperature actually has nothing to do with physical temperature. It refers to the color of the light produced by the lamp, measured in degrees Kelvin. A simple rule of thumb for remembering color temperature is this: the lower the temperature, the yellower the light, and the higher the temperature, the whiter the light. For example, a 2700K bulb has a warm color to it, perfect for living rooms or dining rooms. A 5000K bulb has a very white color to it, often referred to as “natural white” or “stark white,” and is ideal for office buildings, doctors’ offices, and in department stores. Beam Angle: The name is a dead giveaway. Beam angle is simply the angle of the beam of light produced by the bulb. Beam angle is a key factor typically associated with bulbs such as MRs or PARs, which are generally used for things like track lighting or recessed lighting and is measured in two ways, either with actual degree measurements or with a series of designations. The degree measurements range anywhere from 7 degrees to more than 160 degrees, while the designations run from very narrow spot, spot, narrow flood, flood, wide flood, and very wide flood. Center Beam Candlepower: Center beam candlepower, sometimes abbreviated as CB Candlepower, is the measure of the intensity of light produced at the center of a lamp beam, which is measured in candelas. Life hours: This is exactly what the name suggests. Life hours are the number of hours the bulb can be expected to operate. For most lamps, life hours are calculated by observing when 50% of a group of lamps fail. CRI: A bulb’s CRI, or color rendering index, is the measurement a light source has on colors and surfaces. Bulbs with a high CRI (80 and above) make colors appear more vibrant and natural, while bulbs with a low CRI (79 and below) will make colors look washed out and even take on a different hue. Are there any other lighting terms you can think of? Let us know in the comments below, or on Facebook, Twitter, or Google Plus!